Learn more about Ms. Fasano at her website In All Directions and feel free to stalk her on Facebook. You can always count on Ms. Fasano to write about a topic that many women struggle with and do it with finesse. Her characters are also always strong but flawed. How she is able to shine a light on these flaws and allow us to follow their journey to completeness or happiness as they gain insight to tackle their problems head on is one of Ms. Fasano’s greatest strengths. In this second book of Ms. Fasano’s Ocean City Boardwalk series we meet Heather Phillips, the owner and operator of The Lonely Loon Bed and Breakfast. She seems to have her life on track after suffering through a devastating break-up with a fiancé years ago over a decision she made for her own wellbeing. She’s now happy, prosperous, and has good friends she can count on. Her life would be almost perfect if it wasn’t for this cranky author, DB Atwell, who has rented the entire Bed and Breakfast for the whole winter so he can have peace and quiet to finish his next best seller. Heather has been walking on egg shells for over a month now and the quiet is driving her nuts. Heather is a social person who loves getting to know her guests, which is one reason her B&B is such a success, and it is Christmas Eve. It turns out Daniel is dealing with more than his next novel and he is hiding from the paparazzi. I love the way Ms. Fasano is able to unfold her characters through realistic dialogue, it gives the reader a genuine sense of who they are. Daniel’s story is heartbreaking and gut-wrenching as he tries to navigate international politics while trying keep his sanity. When Heather begins to learn his story a compassion is awakened in her that she thought she had safely buried and she is forced to confront her past decision in a way she never imagined. I was able to feel her emotional turmoil as if it was my own. The plot moves at a steady pace, but never too slowly, because there is a lot going on. We also get to revisit and learn more about people and events from her earlier works in this series. While it is not necessary to have read the first book of this series, Following His Heart or the related novella, An Almost Perfect Christmas to enjoy these parts of this story, I have to say that you are missing out on a couple of gems if you haven’t read them. Now I am anxious to learn more about Cathy! I found Two Hearts in Winter a unique, captivating, emotional tale that will keep you thoroughly enthralled until the very end. Don’t miss this one, it will make your heart smile. Two Hearts in Winter is Book 2 in the Ocean City Boardwalk series. This book can be read as a standalone story, as is true with other series books by Ms. Fasano. Looking forward to reading! I just got a copy. KJDonovan, thank you for your kind words and I have to agree with you about Ms. Fasano. I'm glad you dropped in. Whoa! 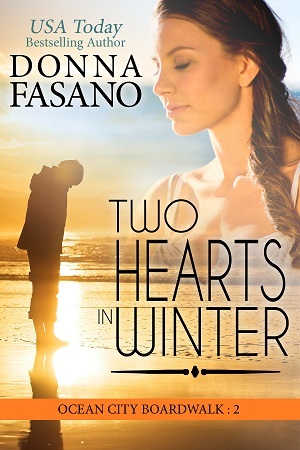 Excellent review of Two Hearts in Winter by an exceptionally talented author. I love the Boardwalk series.